It seems like Christmas has been long gone, and with the New Year when everybody is busy trying to make resolutions or goals, or anything at all, who would remember anything about Christmas? Well, at least I do, especially when you had to make 5 batches of macarons with 6 different fillings in a half a day right before Christmas eve. It might sound "ah, that's nothing", but this is the first time for me making so many different kinds in such a short time. 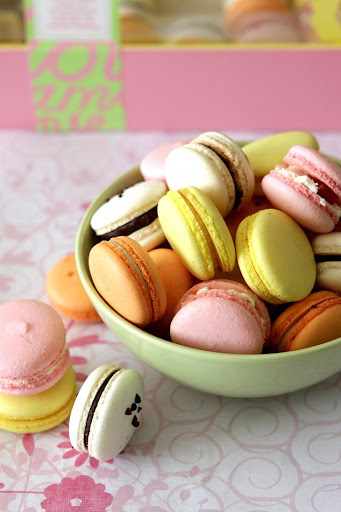 Everytime I see a blog post when people are baking such pretty and oh-so-colorful macarons, it always left me wondered how can they make so many different ones and how would they find the time to do it, especially if you have to rest your macaron batter for some time and bake it one tray at a time? And what do they do with so many of macarons if they make one batch for one color? I tried to think and see if maybe they color the same batter a few different ones, but I don't think that's possible as the batter would be overmixed. In the end, I just thought that they made each color as different batch, which was what I did. 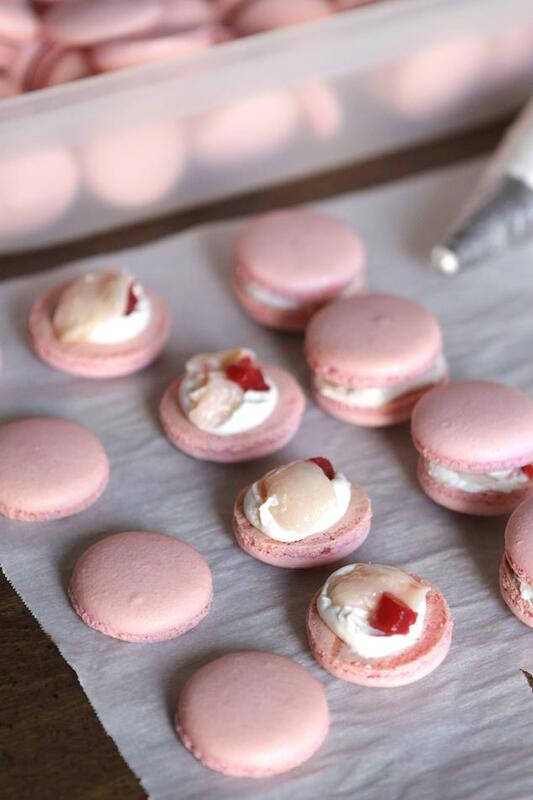 I made lots of macarons before, the last one being 200++, but they're different, they're for a wedding and the same flavor. 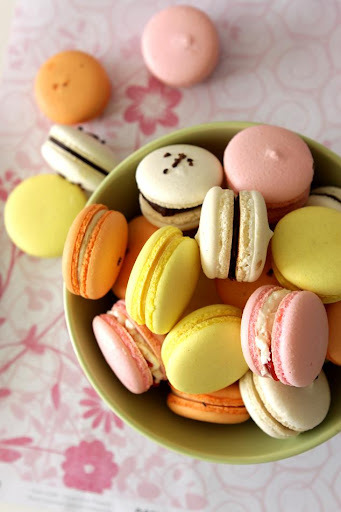 I don't have to worry about making different batch of fillings, and what different flavors I want to make, but I've always wanted to make pretty colorful macarons too so that I can put them side by side and arranged them like little colorful soldiers just like those in a patisserie. One of my friends asked me a month before Christmas (or maybe a bit before), if I would be willing to make some macarons for him to give as a Christmas and thank you gift for another person. That person happens to be a macaron fanatic (so I've heard) and she's been getting different macarons from different places every Christmas time. I couldn't commit at first since my December baking schedule is pretty full, leaving me no time left for just my personal baking. Besides, the thought of me making different batches of macarons scared me, and what would I do with so many leftovers? He persisted and tried to convince me every single day until I said yes (and it's not that hard really :D). If you notice, I tried to make each one to have different characteristic, sweet and floral, a little tart note, bittersweet, salty, sweet and sour. I was so tempted to make another one with green color, but I had no more time and had to stop. It was hard to decide which one I like the most as each of them is so different and I love them all! This is my first time making salted caramel buttercream and I had no idea how it should taste, or how salty and sweet it should be. I was using salted butter and whipped it until light, then added the caramel I made. I think the sweetness is there, but it was a tad too salty, so I need to add more caramel next time. The tahitian vanillie fleur de sel on the top of the macaron added more saltiness to it, so I guess I really should add more caramel. I'm loving this combination and you bet I will make this flavor more in the future, maybe in the cake form. I made the passion fruit milk chocolate ganache before, but ended up throwing it away because I thought it tasted weird. The passion fruit puree was so tart and that even the sweetness of milk chocolate couldn't compromise for it. 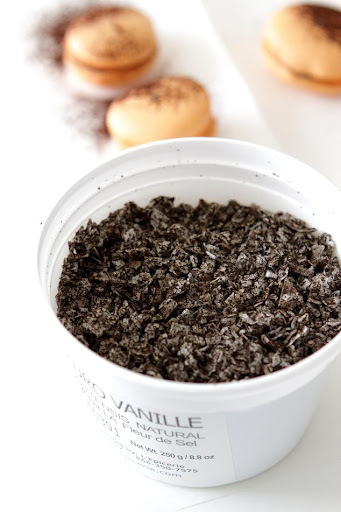 I really want to try it again ever since, especially knowing that this flavor combo is so popular, even in Pierre Herme's shop! I added some sugar to the ganache this time and I think it was perfect! Love it! I ended up with lots of leftover of course but my friends and family were at least more than happy to gobble them up during our Christmas Eve dinner. I recall one of them at least had ten in one sitting and wouldn't stop if we didn't stop him. We brought the leftover macarons (that we specifically reserved on purpose) on our road trip a few days after. After this, I'm more excited to see what other flavor pair I can come up with and the possibilities are endless! So stay tuned to see what's next. How exciting! Chop the milk chocolate into small pieces. Boil the passion fruit, heavy cream, and sugar together and pour over chocolate. Stir until incorporated and the ganache forms. Wait a couple of minutes for the ganache to cool a bit and add the softened butter. Stir to create and emulsion. 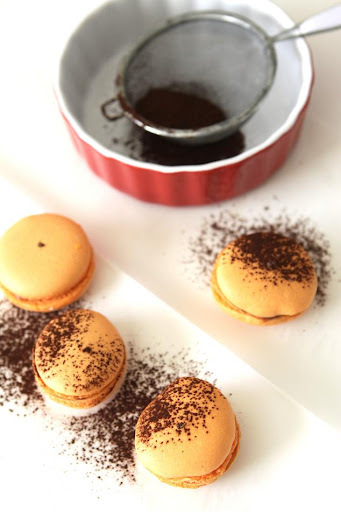 Let it harden a bit until it is pipeable and fill the macarons. Add rose water to the taste and mix well. I'm very impressed with your perfectly "crafted" macarons. They are so beautiful. These are gorgeous, and the flavors sound fantastic. 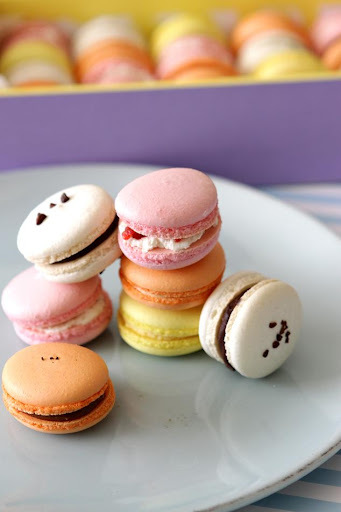 I've been wanting to make macarons for a long time, and your recipes might just be the catalyst I needed! Just stumbled across your blog: WOW! The macarons look amazing! Great photos, great colors. 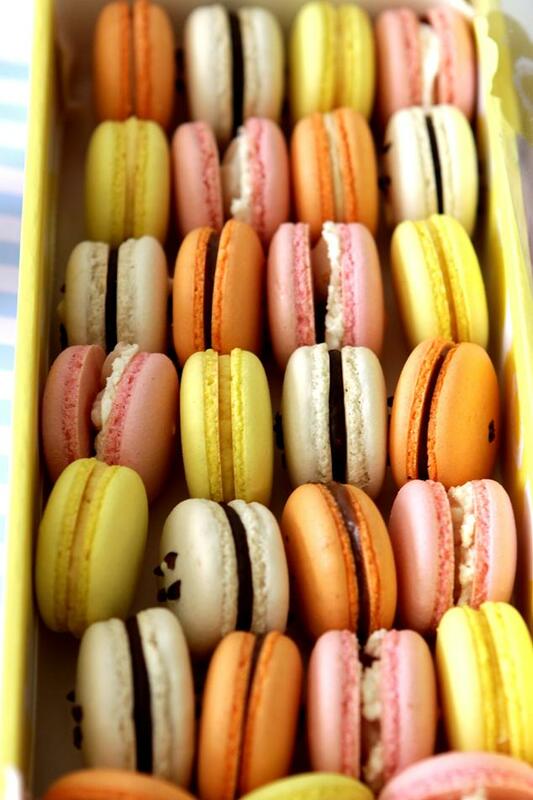 This winter while in Paris I was disappointed by some I got from Pierre Hermé ( if interested, check them out here.) Yours seem much nicer. 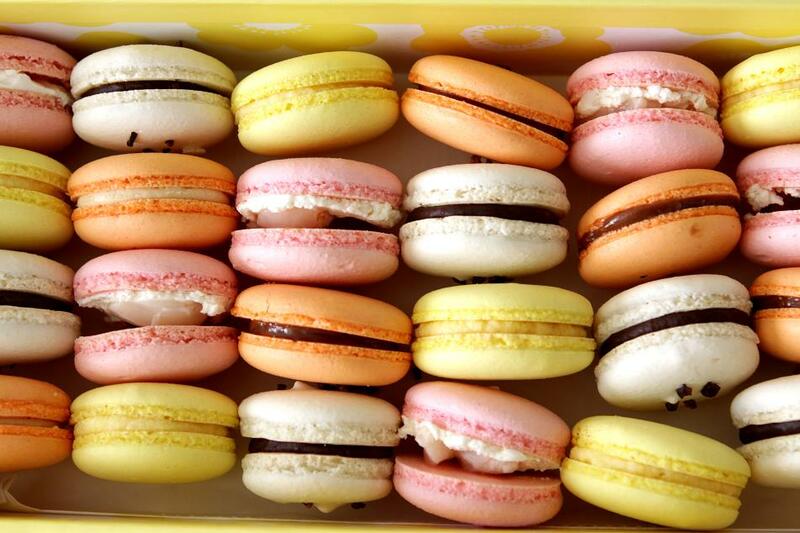 What a pretty group of macarons. I love the pastels. I usually make one variety at a time, I couldn't handle making this many at once! Maybe once I get my technique down. Wow. You are amazing. They look so beautiful! The colors are so pretty! 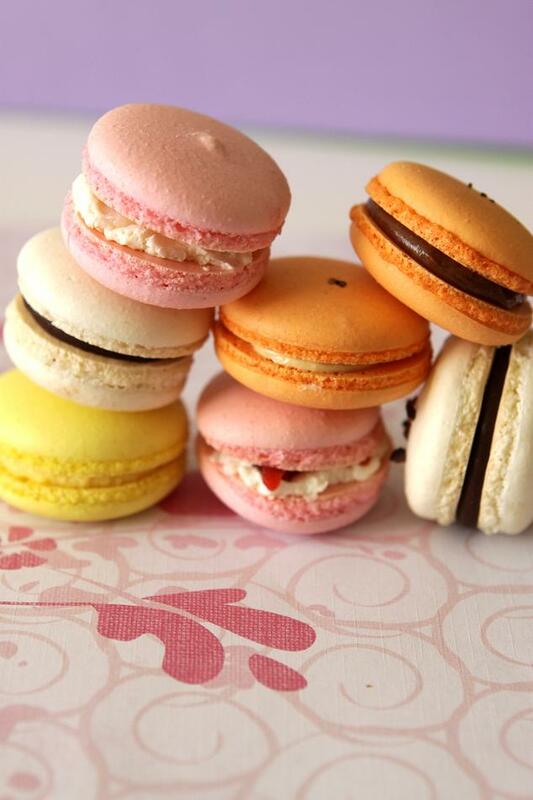 I love the look of your macaroons! 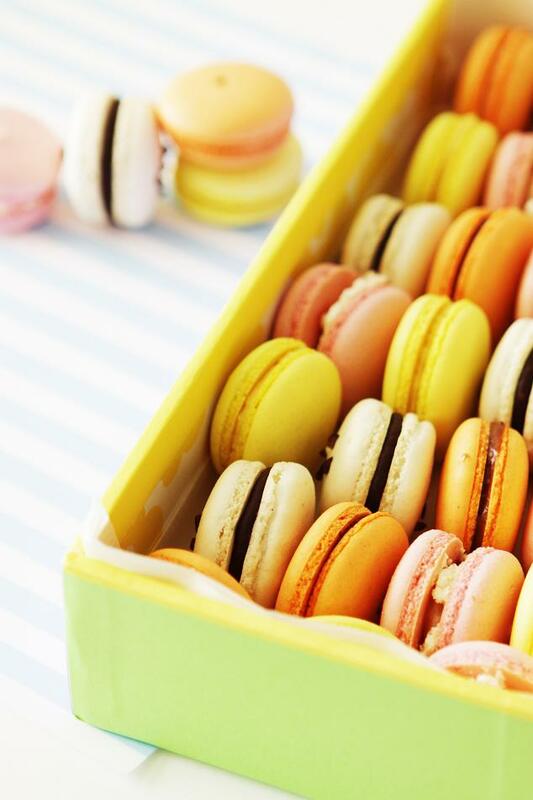 beautiful macarons! may I ask what you used to color them? liquid or powdered dye? Yummy! 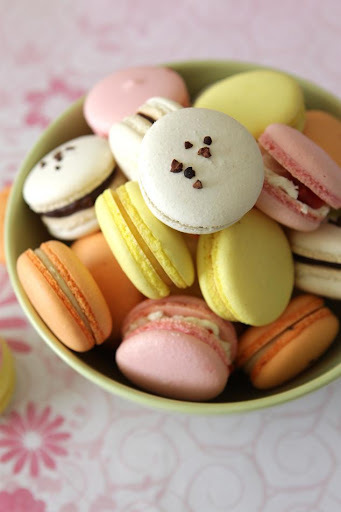 Very cute macarons. Looks delicious perfect for giveaways. Beautiful and they look like they taste awesome!!!!!!!!!!! I been trying to look for passion fruit puree here in SJ and no luck. Can you suggest some places to get them. All your macarons looks amazing!! Beautiful! 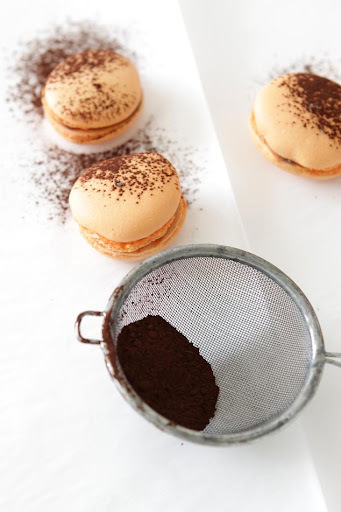 I've had some success with the uncooked sugar method and really want to get into the italian version because they have a look that is pretty rare when i scour the web for the french method. stunning! I am a little confused by the recipe though. Please clarify the steps to adding the meringue to the almond-sugar mixture and what I should see in the in between steps. Thank you!! fiercefoodie: to mix the meringue into the almond-sugar mixture, put some of the meringue in, and mix thoroughly (you will need to be a little rough with this). Once that's mixed, add the rest of the meringue in 2-3 additions and fold well.